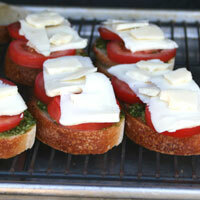 Tomatoes, fresh pesto, good bread, and cheese! Make pesto and set aside. 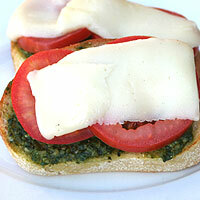 Slice tomatoes, mozerella, and asiago, set aside. Preheat oven broiler or grill on high. Slice the bread into 1 inch thick slices. Brush both sides with the oil. 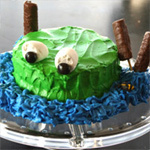 Place a cooling rack on a jelly roll pan and set aside. Set each piece flat on the hot grill. Cook 2-4 minutes or until it starts to brown. Grills often don't distribute heat very evenly, so check each piece periodically. Turn each piece and cook 2-4 minutes more, until it starts to brown. Transfer slices to the prepared cooling rack. 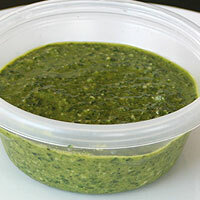 Spread 1 tablespoon of pesto on each slice. 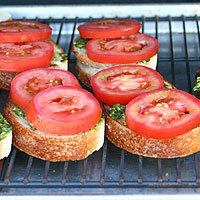 Top with two tomato slices. Top with asiago and mozerella. 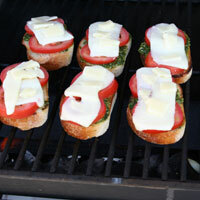 Place back on grill or in oven broiler and heat until cheese just starts to melt. Soggy bread- tomatoes can of course turn the bread soggy. The olive oil and high heat cooking will help prevent this. 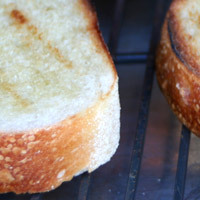 Hard bread- Don't overcrisp the bread or it will of course become hard. 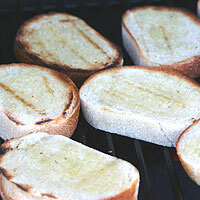 Limp bread- Keep the crisped bread on a cooling rack or the bottom will turn soft. 1. Make pesto and set aside. 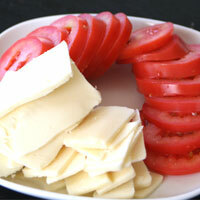 Slice tomatoes, mozerella, and asiago. Set aside. 2. Preheat oven broiler or grill on high. 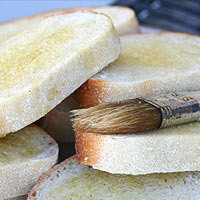 Slice the bread into 1 inch thick slices. Crush garlic into the oil. Brush both sides with the oil-garlic mixture. Place a (2)cooling rack on a jelly roll pan and set aside. 3. 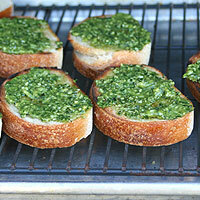 Spread 1 tablespoon of pesto on each slice. Top with two tomato slices. Top with asiago and mozerella. 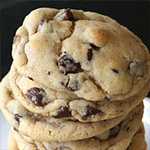 Place back on grill or in oven broiler and heat until cheese just starts to melt. Serve immediately. 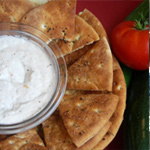 To broil: set each piece flat on prepared cooling rack, broil 2 minutes or until the edges start to brown. 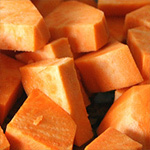 Flip each piece and broil an additional 2 minutes, or until the edges start to brown. To grill: Set each piece flat on the hot grill. Cook 2-4 minutes or until it starts to brown. Grills often don't distribute heat very evenly, so check each piece periodically. Turn each piece and cook 2-4 minutes more, until it starts to brown. Transfer slices to the prepared cooling rack.